The circle that isn't on the stroke is where I started actually drawing. For some reason, both FireAlpaca and Medibang do this. I've tried other programs, and they've proven to not do this, although what bothers me about those is they have a limited number of features in comparison. How do I fix this? I don't have any experience with Windows Surface or the Surface Pen but you might want to check it's settings. I'm guessing the OS is Windows 10 so it should be under Settings>Devices>Pen & Windows Ink then check what you can toggle under pen settings. AFAIK Windows will want you to just toggle settings to it's programs but maybe it has a means of changing shortcut settings for other programs. As far as Medibang goes you can always check shortcut setting under File>Shortcut Settings but I think it'll only let you select keys on the keyboard. Thanks for the reply. Those are all the first places I checked. 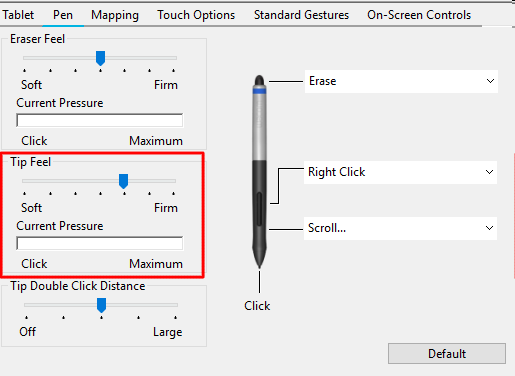 The surface pen side button is already registered to be right click and it works in other apps. Right clicking with the mouse in Medibang makes the eyedropper happen but when I click with the surface pen button it isn't making the eye dropper happen like I want it to. It would make drawing soo much easier. I'm still not sure why it's not working they way it should. Hey! I see that you kinda got a gist of what you are doing. I got a problem.. :c basically I cant draw untill my pen is outside of a circle?? Like I am drawing where my cursor is and I cant draw till i get outside that circle thing.. Can you help me? so i'm no professional at medibang and certainly can't speak on behalf of the company with regards to certain issues but i do know a few things. I'm having problems with colours in Medibang. Whatever colours I use in Medibang is exported slightly lighter than it shows in Medibang. If I save the file as a Photoshop document, the problem gets even worse. I need to play around with a lot of settings if I want to get it to the same colours. Does anyone know how to resolve this issue? im not sure if I've seen this before and if si i probably wasn't aware.juat curious does is do this when you 'save as' or only when exporting the file? there may also be something on medibangs help forums on their website but it may take some digging but i imagine keyword relating to color or exporting may help narrow the search. This issue arises when I use 'save as' or simply export it. I found those setting you spoke about but I don't really understand how to use them. I will keep trying. I found the right setting. If I change the color settings to "monitor color", the color on photoshop will be the same as Medibang. hi! i've recently uploaded an image to the medibang cloud from my computer to use it on my phone, but i don't know how to move it from the cloud to local saves? if anyone could tell me how to do this, that would be GREAT! thanks for reading!!! Have you tried opening it and then click option "save as"?